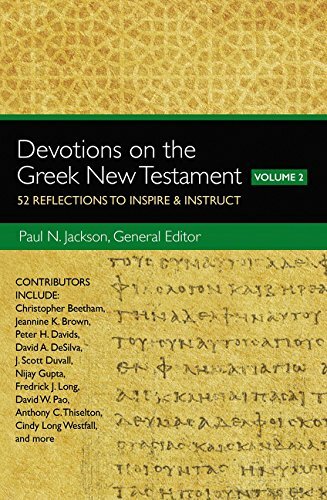 Devotions on the Greek New Testament, Volume Two contains an entirely new set of 52 devotions written by over 25 of today's best biblical language scholars. Contributors include Christopher Beetham, Jeannine K. Brown, Peter H. Davids, David A. DeSilva, J. Scott Duvall, Nijay Gupta, Frederick J. Long, David W. Pao, Anthony C. Thiselton, Cindy Long Westfall, and many more. The main point of each devotion in Devotions on the Greek New Testament, Volume Two comes from a careful reading of the passage in the Greek New Testament, not from an English translation. The authors use a variety of exegetical approaches in their devotions - including grammatical, lexical, rhetorical, sociohistorical, and linguistic - and each devotion closes with a practical application or spiritual reflection.